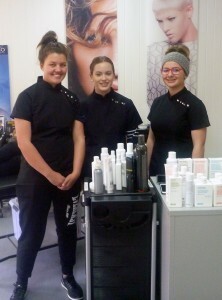 Students Chloe, Olivia and Tayla ready to provide salon treatments to clients. The YES Centre Hair and Beauty Salon was open for business on Tuesday, August 15. Students undertaking Certificate II Salon Assist and Certificate II in Retail Cosmetics had the opportunity to be part of a functioning salon by providing an array of treatments to PASS staff and students in a Salon Day. Students have learnt about treatments and services, and have been perfecting them, in the past two and a half terms. Course lecturers Mrs Kristy Kuhn and Mrs Belinda Myles supervised students. “Once the students are competent performing treatments such as wash and blow dry, hair straightening, paraffin manicures and facials, we open our salon to simulate an actual salon environment, allowing students the experience of working with paying customers,” Mrs Kuhn said. Year 10 student Chloe Brusnahan, who is studying both Certificate II Salon Assist and Certificate II in Retail Cosmetics, said the salon day allowed her to mark off some required skills in her courses. She said the most valuable part of the day for her was the customer service experience. “Getting experience dealing with customers, not just fellow students, was valuable,” she said. She said she was kept busy during the day.